For some unknown reason, the racecourse vendors stop selling Daily Racing Forms early on Mondays. Patrons leaving the racetrack after the fifth race are unable to buy a Form for Wednesday. It can be frustrating. On the other hand, it can be a blessing. Maybe, when a race meet runs 36 days, getting a break from the horses is a good thing. Tuesdays, being dark days, provide perfect respites. Although the antique shops in nearby towns such as Hudson and Cambridge are closed, the museums in Williamstown and Stockbridge are only an hour and a half drive away. 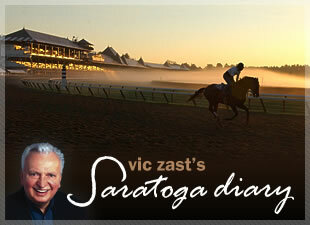 Moreover, Bill Richardson has whipped up the Saratoga Spa Golf Course into tip-top shape. Hattie’s serves an all-you-can-eat buffet. But, in the meantime, it’ll be a long time before anyone sees another trainer send out horses to finish one-two-three-four in a Saratoga stakes race. That’s what Linda Rice did in the sixth, the $80,000 Mechanicville Stakes for New York-breds. J.R. Velazquez, the meet’s leading rider, bested Rice’s three other riders – Javier Castellano, Ramon Dominguez and Kent Desormeaux – aboard Ahvee’s Destiny. Rice, in sleeveless red blouse and sunglasses, seemed unfazed. A race later, Country Star, once thought to be an unbeatable filly, made her successful comeback since finishing sixth on a sloppy track in the Kentucky Oaks (gr. I). Trainer Bobby Frankel chose a one mile, non-winners of two on the grass for his 4-5 runner. She hung on in 1:36.56 and overcame a jockey’s objection, as well. Rick Dutrow’s By the Light withstood a steward’s inquiry to win the co-featured $80,000 Union Avenue. Back with her own kind – meaning New York-breds -- By the Light swung wide on the turn causing another horse to go wider. Regardless, there was no foul so blatant that the stewards had to take her number down. Two hours later, a day of amazing feats ended with the 6th annual Jockeys vs. State Police softball game. Down 8-0 after one inning and 9-0 after two, the jockeys appeared doomed. “We were in trouble. We had some guys that never played baseball,” said team manager Eddie Brown, assistant clerk of scales in his day job. Brown was talking about Rajiv Maragh, of course. Maragh was seen getting lessons on how to swing a bat from Jerry Bailey. In any case, it’s not how you play, but how you look, and the team looked “mah-velous.” Its members wore snappy black and white jerseys from the Stadium Café. An outstanding outfield of Castellano, Channing Hill and Robby Albarado kept the home team in the game, while pitcher Angel Cordero, Jr. kept the score from getting ugly. Eibar Coa flashed a good glove at shortstop. The Usain Bolt-like Hill homered. So did other guys, although the action was so fast and furious, it was hard to tell who they were. The final tally was Jockeys 19, State Police 15. More than $5,000 was raised for the Catie Hoch Foundation. Raffle prizes included a bamboo handle beaded cheetah purse, a New York Mets window cling baseball, Tree-Free kitten cards and two pounds of fudge.